Ivy (by Sono Mocci from Italy) is one of many creative, cool design entries from more than 3000 participants in the recent DesignBoom competition, Seoul Cycle Design Competition 2010. While it might be irrelevant that the design is made of plastic (i.e. metal rusts quite easily), potentially too thin, etc, it is more about ideation. Features can easily be augmented and adjusted accordingly. Rather, it is simply the concept and notion of how competition helps us brew creative ideas. 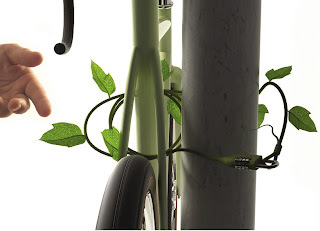 Inspired by nature, the design of this cable wire lock is mimicry of ivy. It is unified in our daily scene and promotes protection of the environment. This is a classic example of true biomimicry and as the competition unfolds, more brilliant ideas are being shared. While the awareness is spreading, many have their eye on the prizes and awards in three main categories of cycle design, cycle fashion and accessories and cycle infrastructure (storage and equipment). The conference opens with views of a sustainable future, and a message from Senator Casey urging support for his legislation rescinding the Marcellus Shale exemption from the Safe Drinking Water Act.This conference examines the health, environmental and community effects we will experience from Marcellus Shale drilling and offers solutions from other places. As we urge precautions to be taken to protect our air, water and fertile land from the effects of development, we also continue to focus on building the infrastructure, economic and social structure to move to a renewable and sustainable energy base soon. Dr. Karl-Henrik Robert of Sweden, founder of The Natural Step framework and principles will give the keynote address, followed by Mayor Ken Melamed of Whistler British Columbia whose community has implemented a sustainable policy. There will be several presenters discussing energy systems based on wind, solar, anaerobic digestion of municipal sewage or dairy manure to produce methane in a sustainable way while solving other water and land use issues. This is a provocative discussion with an eye toward moving forward now to a sustainable future. Funny how the economy continues to thin out jobs for hard, working individuals that pay taxes and actually spend money towards sustainable items. Which brings me to the idea of giving to others? Why is it that some people give and often give more while others continue to consume without any regard? How do we change this disgusting habit? Surprisingly this isn't a new concept. We have been trying to change our ways for sometime, yet often fail and resort back to our Neanderthal ways. Well, kudos to one Cleveland-based company named Earthworks System. They just aren't any old company buying and selling resins, exporting scrap and developing recycling programs. They are special because they too are part of the continuous "giving cycle." With the holidays approaching, millions of the plastic cards are heading for the hands of joyous consumers. The sad part is those ignorant fools are sending those cards to the landfills once they get their kicks of buying more consumer based goods. This thought actually inspired a Cleveland-Solon man to develop a new recycling method used today at Earthworks System. They collect polyvinyl chloride scrap left over from the card manufacturing process, discontinued stock, canceled jobs, and spent cards. Card manufacturers and distributors donate most of the PVC, with retailers and individuals supply the rest. Earthworks then ships the plastic to a manufacturer where it's shredded and pressed into plastic sheets, ready to be made into new cards. With only being founded in 2005, the company has recycled nearly 4 million pounds of plastic. 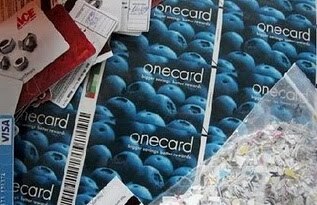 And funny how simple things can go viral, too.. An employee at an Ace Hardware in Sacramento, CA, learned about Earthworks online and mailed an envelope stuffed with a couple hundred spent gift cards. What's next on your list to recycle?